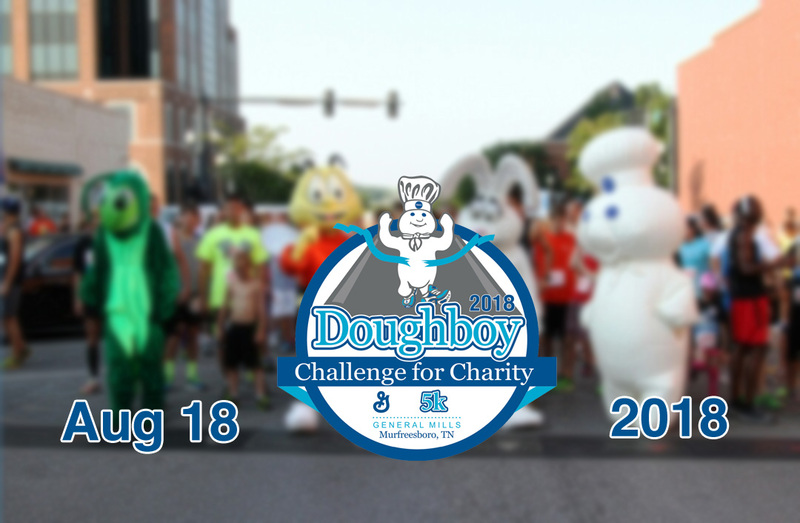 The Doughboy Challenge is a family friendly 5K through downtown Murfreesboro. The Doughboy Challenge raises money for local charities and this year we're supporting United Way. Lace up your running (or walking) shoes and bring the family out to see all of your favorite General Mills characters before and after the race. Strollers are welcome! Please contact doughboychallenge@gmail.com for any questions or concerns. Runners can pick up their packets at Civic Plaza between 11 AM and 6 PM on Friday, 8/17. Registrations on the day of the race can pay in cash, check, or credit card. Please make checks payable to Doughboy Challenge. Online registrations close on Friday, 8/17 at 11:00am. Manual registrations will be available on Saturday before the race begins. The 5k race will take place on 8/18/2018 at Civic Plaza in downtown Murfreesboro, TN. The race begins at 7:30 AM.